only water gradient contact lens. 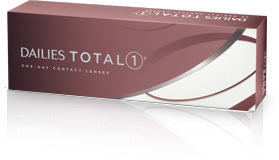 DAILIES TOTAL1® Water Gradient Silicone Hydrogel (SiHy) contact lenses represent a new era of comfort. They are the first water gradient silicone hydrogel daily disposable contact lenses featuring an increase from 33% to over 80% water content from core to surface. This innovative contact lens has the highest surface lubricityi and the highest breathability (or oxygen transmissibility) of any leading daily disposable contact lensii, delivering exceptional comfort that lasts to the end of the day. At the core, DAILIES TOTAL1® Water Gradient SiHy contact lenses have a water content of 33%, which allows exceptional oxygen transmissibility - the highest of any daily disposable contact lens with a Dk/t of 156 (Dk/t @ -3.00D)vi. 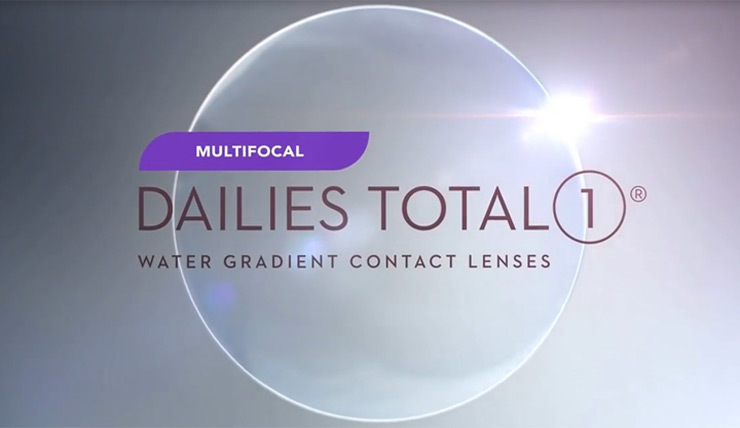 Between the core and surface, DAILIES TOTAL1® lenses have a transition zone where the water content changes from 33% to over 80%. At their surface, the new contact lenses have a water content of over 80% - nearly the same as the surface of the cornea. The highly wettable, lubricious surface helps minimize friction and interaction with the eye’s delicate tissue. View DAILIES TOTAL1® Water Gradient Contact Lenses or other DAILIES® Brand Contact Lenses package inserts with important use and safety information. **Percentage of wearers agreeing with the statement "I prefer these lenses to my previous contact lenses" among those with a preference. † Eye exam may be required. Professional fees may apply. At participating offices. †† Percentage of wearers agreeing with the statement "With these lenses I sometimes forget I have them on. §§ Dk/t at center of -3.00D lens based on manufacturer-published values. 1 In a clinical study with 80 patients. Alcon data on file, 2011. 2 Angelini TE, Nixon RM, Dunn AC, et al. Viscoelasticity and mesh-size at the surface of hydrogels characterized with microrheology. ARVO 2013;E-abstract 500, B0137. 3 Based on the ratio of lens oxygen transmissibilities among daily disposable contact lenses. Alcon data on file, 2010. 4 Based on an ongoing survey in Europe of 24 ECPs fitting 280 patients in DAILIES TOTAL1® contact lenses. Alcon data on file, 2012. 5 Based on 3rd Party Industry Report, MAT March 2013; Alcon data on file. 6 In a randomized, subject-masked clinical study, N=40. Alcon data on file, 2011. 7 Thekveli S, Qiu Y, Kapoor Y, Kumi A, Liang W, Pruitt J. Structure-property relationship of delefilcon A lenses. Cont Lens Anterior Eye. 2012;35(suppl 1):e14. 8 Alcon data on file, 2011.